Closing date for the competition is Friday 13th April 2018. Terms and Conditions apply, please see the website. Do you suffer from ongoing or referred pain? Equilibrium assessments, look at your biomechanics and myofascial system, to track the web of injuries and teach you, the tools and skills to be able to work through a personalised program in the safety of your own home. Sue has developed this program over her 25 years in the fitness and wellbeing industry, as a biomechanics coach and having worked as head trainer for Triggerpoint and numerous training companies across the globe. Fascia is a specialised system of the body that has an appearance similar to a spider’s web or a sweater. Fascia is very densely woven, covering and interpenetrating every muscle, bone, nerve, artery and vein, as well as, all of our internal organs including the heart, lungs, brain and spinal cord. ‘Myo’ means muscle and ‘fascia’ means band. It is like a superficial body suit which covers all of your muscles allows you to move freely, breath properly and perform our daily tasks pain-free. It spans the whole body and is totally connected as one piece of material. It is called “the tissue of movement”. Myofascia is a continuous structure that exists from head to toe without interruption. In this way you can begin to see that each part of the body is connected to every other part by the fascia, like the yarn in a sweater. What causes Fascia to change? What is Self Myofascial Release and how will it help me? Self-myofascial release (SMR) has been shown to relieve muscle and joint pains and improve flexibility and range of motion. The goal of myofascial release is to elongate and soften the connective tissue, creating a permanent three dimensional length and width change. Using a GRID foam roller helps to break up trigger points and soothe tight fascia, while increasing blood flow and circulation to the soft tissues. This can lead to improved range of motion, flexibility and movement, increased blood flow and will assist in returning your muscles to normal function. This creates a decrease of muscle tension, which in turn will help prevent injury and improve performance. Alleviate knee, lower back & ankle pain. Find out more about the benefits and read testimonials. 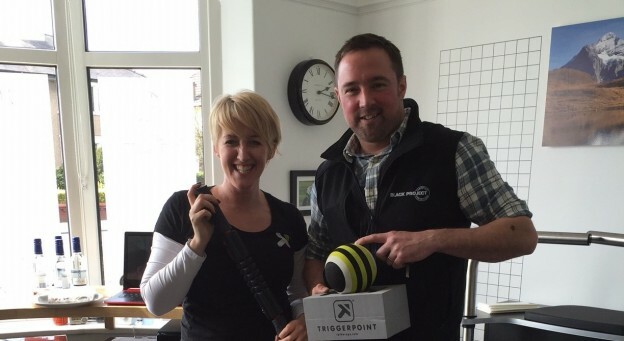 We would like to say a massive thank you to Trigger Point International Master Trainer Sue Wilkie. We had an amazing afternoon of intensive myofascial release Trigger Point training! We learnt about our Trigger Point massage products, how to use them and their benefits. Learning Myofascial Compression Techniques to release tightness and stiffness in the muscles, tendons and myofascia. By oxygenating the blood and releasing the tightness, it makes your feet and legs feel lighter! It really does add a “spring to your step!” Perfect! “John Lenehan takes us past seven million bricks on a walk with one of the finest start points in Lancashire…Whalley has everything going for it and that is why it is one of the busiest little villages in Lancashire. Railway buffs can admire the huge multi-arched viaduct that spans the Calder Valley and occasionally catch sight of a steam train crossing it. History buffs can tour the ancient abbey and church and shoppers can trawl the high fashion and gift shops and enjoy the delights of the many cafes. Then, to top it off, there are fantastic wine bars and pubs. All are good reasons to start and finish a walk there.